Members of the Federation Council proposed a new bill that would allow Russians to own and carry firearms. The Federation Council, the upper chamber of Russia’s State Duma, has proposed that the public be allowed to own and use firearms. Alexander Torshin, deputy speaker of the Federation Council, is planning to submit a draft bill to the president that would allow service pistols to be used in self-defense. According to the document, a person would not be jailed for shooting under such circumstances. The bill is expected to be submitted to the State Duma early next year. However, passing the law may be easier than getting the public to accept it. The current federal law on weapons gives civilians the right to keep hunting rifles and shotguns, traumatic pistols, gas guns, electroshock weapons, air guns, and some cold blade weapons, but bans ownership of civilian service pistols. The authors of the Federation Council report maintain that crime declines as legal ownership of weapons increases because criminals fear that anyone they attack could be carrying a pistol. Under current Russian law, however, victims who are overzealous in their self-defense are often sent to jail themselves. Alexei Rogozin, a member of the Central Council of the Target Practice Federation and the head of the Self-Defense group, believes that purchases of handguns should begin to be permitted for certain categories of citizens. 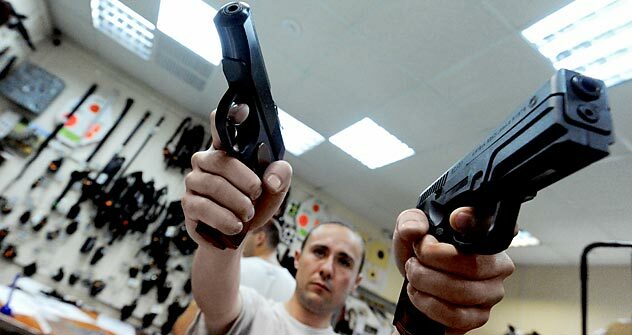 Experts are confident that handguns will reduce crime rates in Russia. They cite the example of Moldova, where similar legislation was adopted in 1995, reducing the number of murders has declined from 8.39 per 100,000 population in 1995 to 5.9 in 2007 . Experts also see a direct economic benefit from allowing the legal sale of handguns. The potential market in 2012, according to their estimates, is 1.5 million people, and it will grow 10 percent each year. According to the most conservative estimates, the volume of this new sector of the economy would be 746 billion rubles over 10 years. “The development of markets for civilian weapons also has another economic component, since it would promote several other branches, such as the machine-building, chemical, and light industries. It will also promote shooting sports,” Rogozin said. First published in in Russian in the Izvestia newspaper.